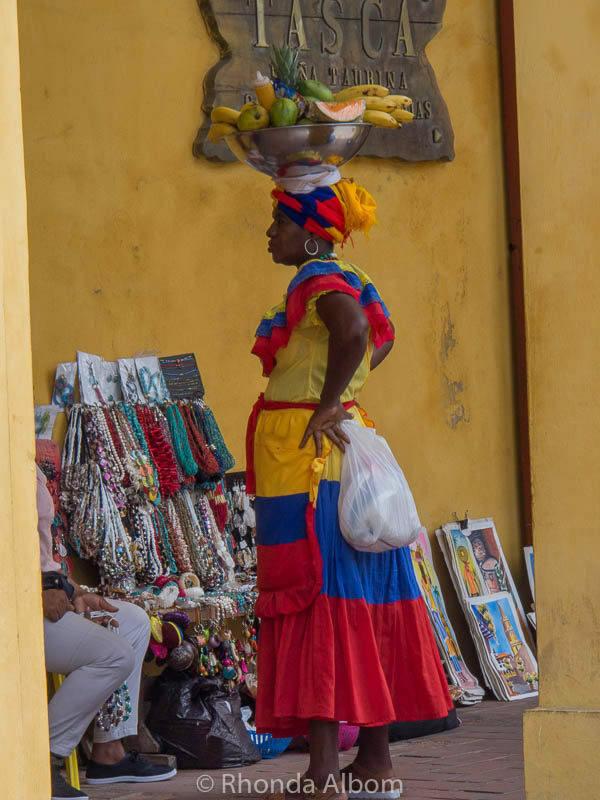 Cartagena Colombia is a city with a sordid and colourful history, from the pre-Colombian settlement to the Spanish conquistadors who capitalised on the gold, silver, and slave trade thus attracting pirates. 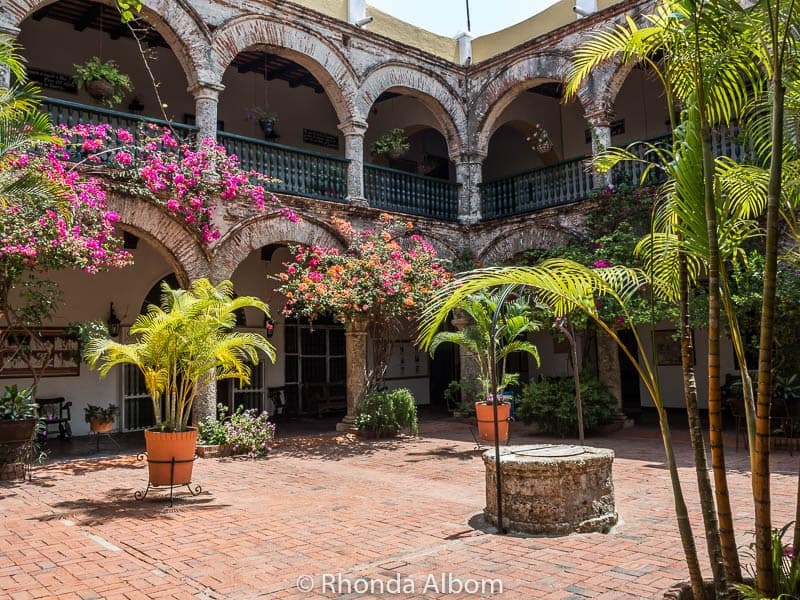 While the forts and tall city walls built to protect the city remain, architecturally, it is the Spanish colonial houses with flower-covered balconies that captured my attention as images of the movie Romancing the Stone flashed through my head. 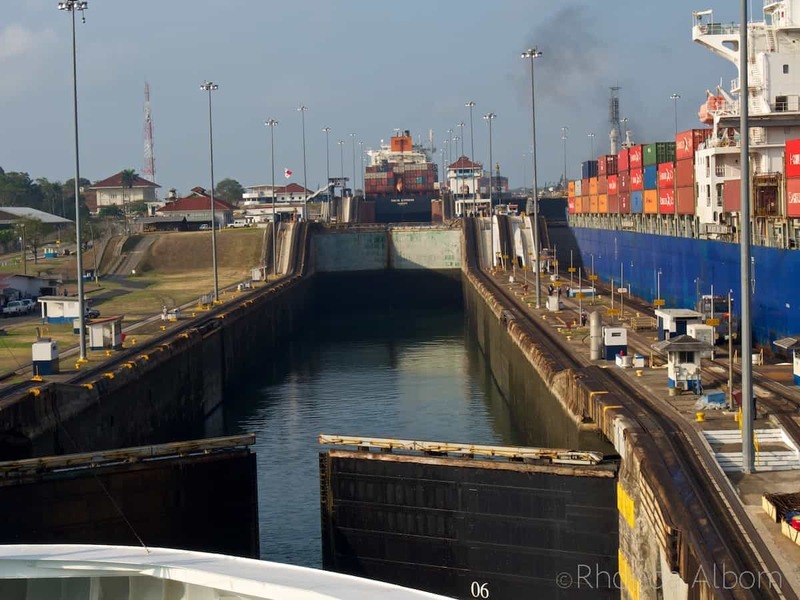 We had a wish list of top sites and hired a private driver at the port, as our visit to Colombia was a stop on our way to cruise through the Panama Canal. Our driver’s command of English was good, but not great. His slow, deliberate manner, mixed with my basic understanding of Spanish made him a fairly good choice. Our driver made a point that Cartagena is safe and the drug cartels are located in the capital – Bogata as well as in Calle and Medellin. Then he turned a corner, and, pointing out the window, he identified Pablo Escobar’s old house, giggling as he added he now lives in a much smaller space – in the cemetery. Safety is a relative scale. When in South America we try not to draw too much attention to ourselves. We never wear expensive looking jewellery or carry a large camera around our necks. In most cities, including Cartagena, I have my Olympus OMD Em5, but I keep it in the bag except when I am taking photos. To date, we have been in six South American countries without any trouble. Check out our basic safety guidelines here. 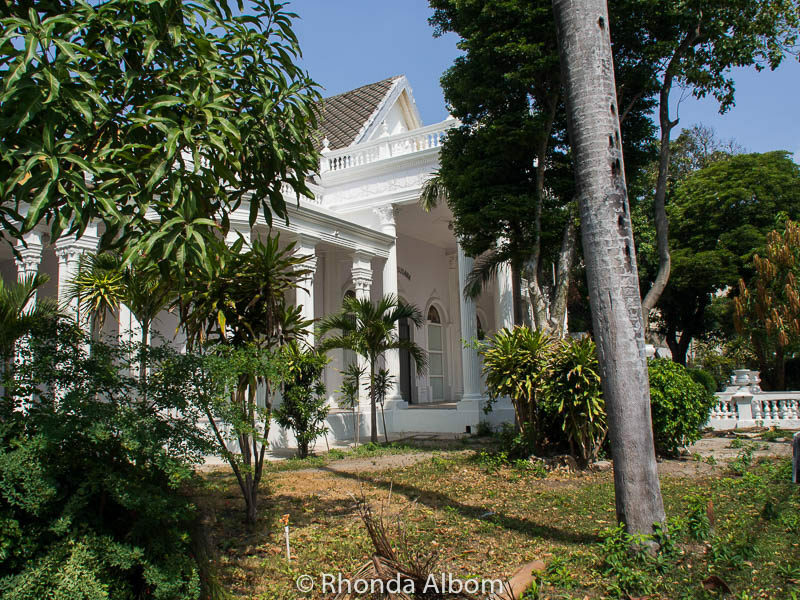 Pablo Escobar’s former house in Cartagena Colombia. If you worry about safety, you might want to get a tour. Local guides tend to know how to stay safe. Standing on Pasta Rillo fort wall overlooking the sea. Cannons line the Pasta Rillo fort wall. This portion of the Cartagena wall is the escape route used at the end of the movie Romancing the Stone. 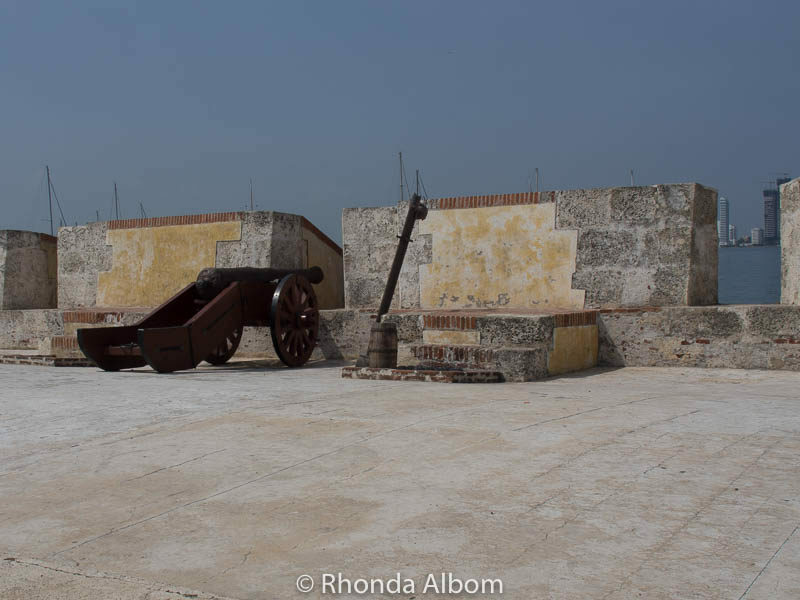 Castillo de San Felipe De Barajas is the largest Spanish fort built in the New World. The old boots (Botas Viejas) statue. La Popa is an active monastery 150 metres above sea level built in the early seventeenth century. 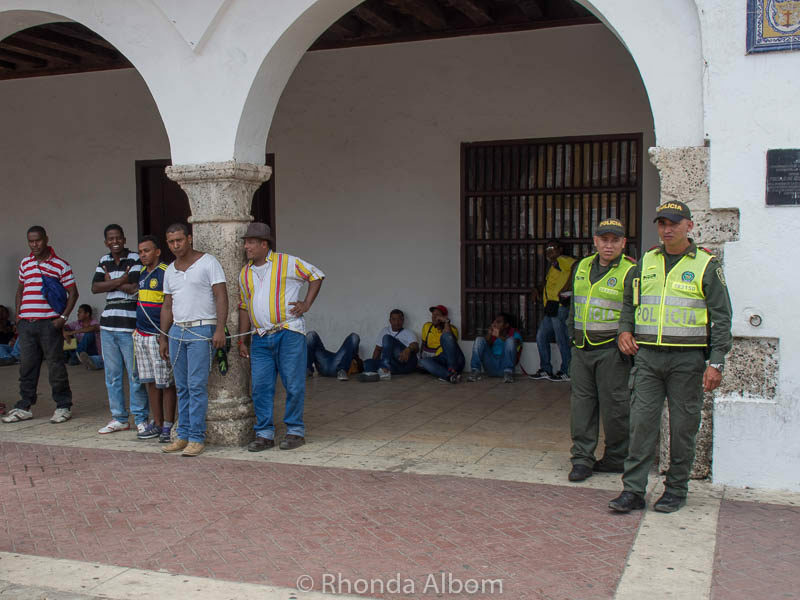 Once a prison, Las Bovedas is now a tourist shopping area featuring 24 shops. Woman carrying a fruit basket on her head. Atlanta Square, home of the Cartagena mayor’s office. We are not sure why these protesting men have chained themselves to the columns. 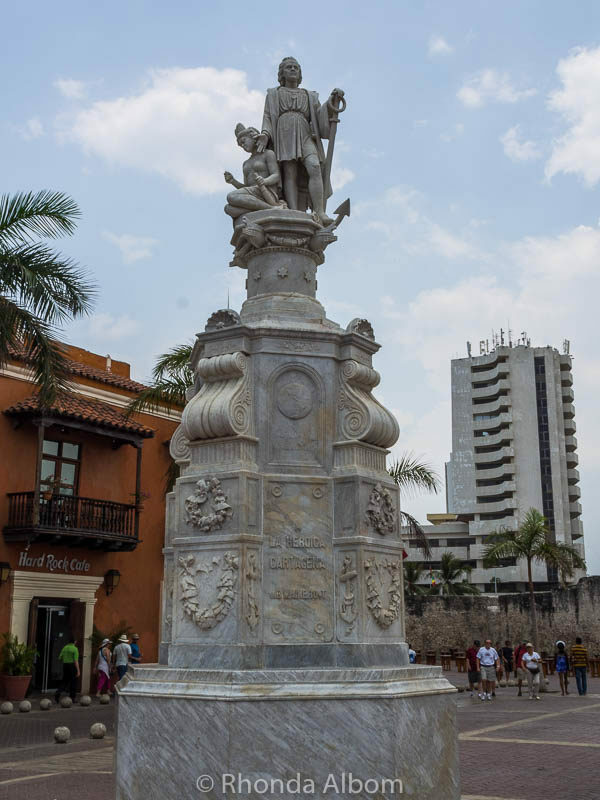 Statue of Christopher Columbus in Atlanta Square in Cartagena. A local’s street in old town Cartagena. 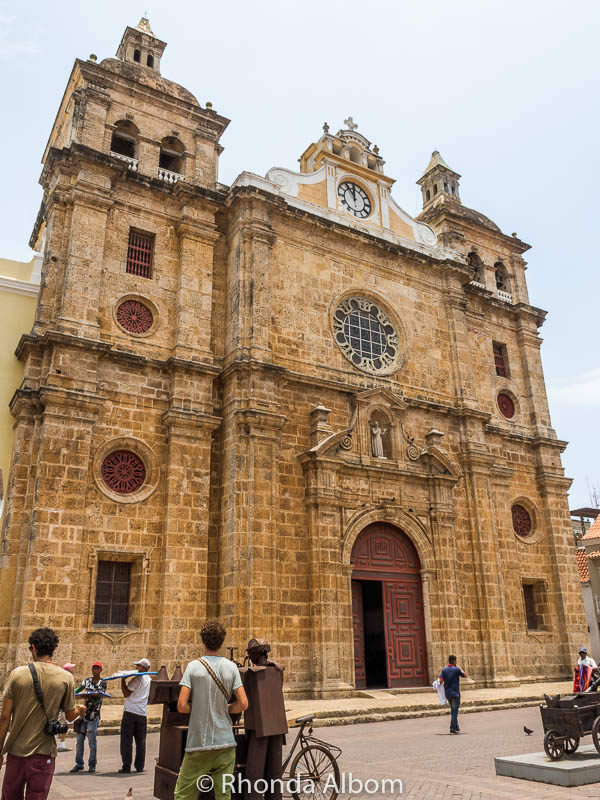 St. Peter Claver church in the old city of Cartagena. Interesting street art. See more South American street art here. 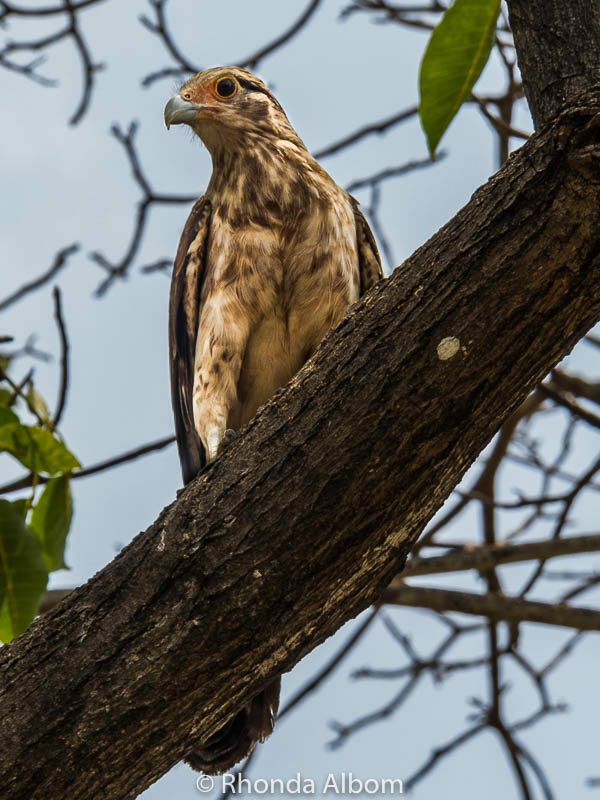 I don’t know what type of bird this is. Do you? 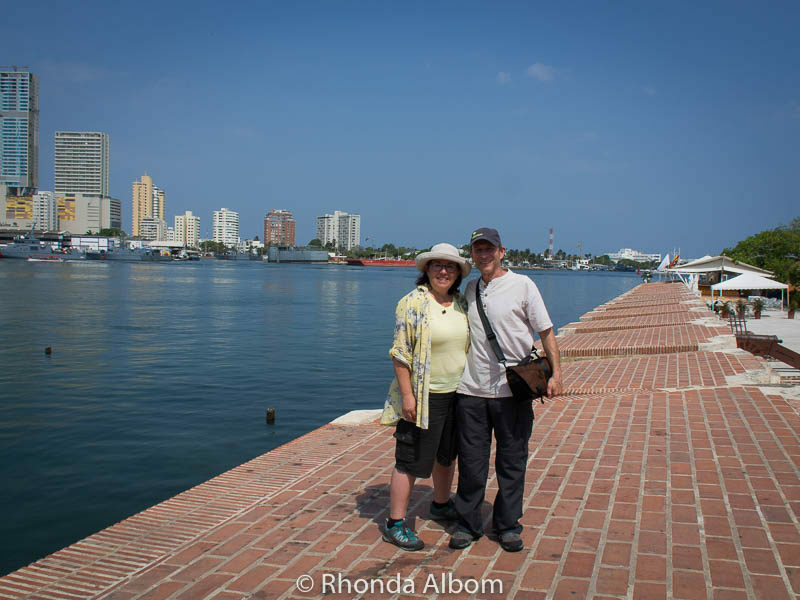 We also saw toucans, peacocks, Grackles, and other interesting birds at the port oasis outside the cruise port in Cartagena Colombia. 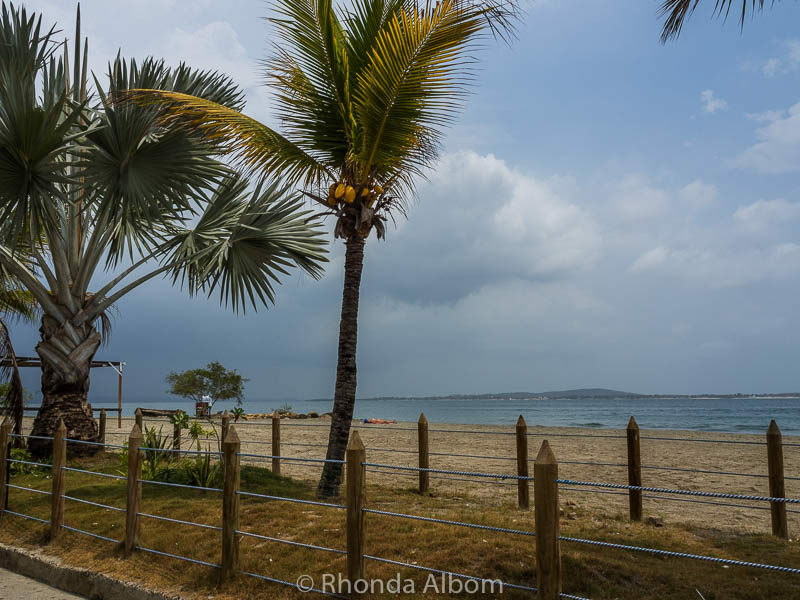 One of the many lovely Cartagena Colombia beaches. As a coastal city, there is a seemingly endless number of Cartagena beaches, many completely filled with umbrellas, while this one seemed less popular. Don’t Forget to Get a Colombian Coffee! Of course, we stopped for some Colombian coffee in Plaza Santo Domingo. Here, we also found the bronze “La Gordita” (the Fat Lady) statue. Her “shiny bits” are those that are most often touched by those passing by. The statue was a gift to the city in 2000. 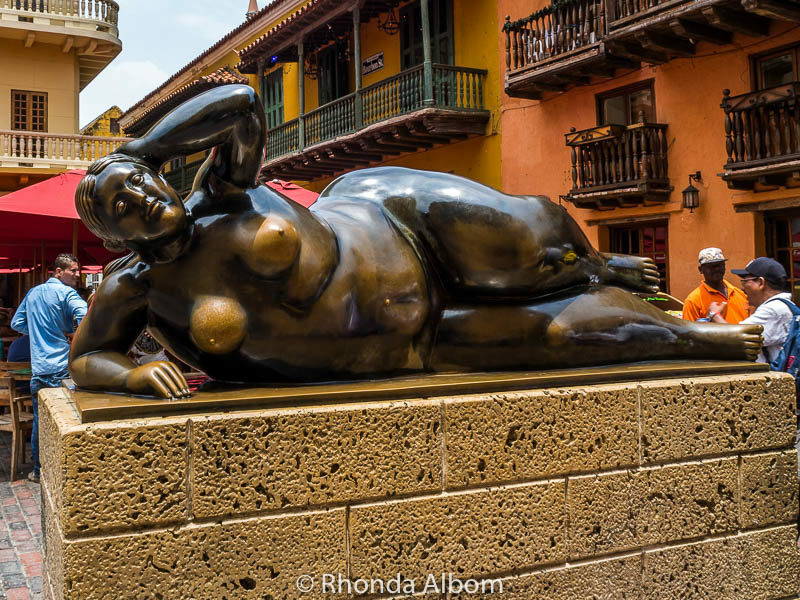 “La Gordita” (the Fat Lady) statue in Plaza Santo Domingo. 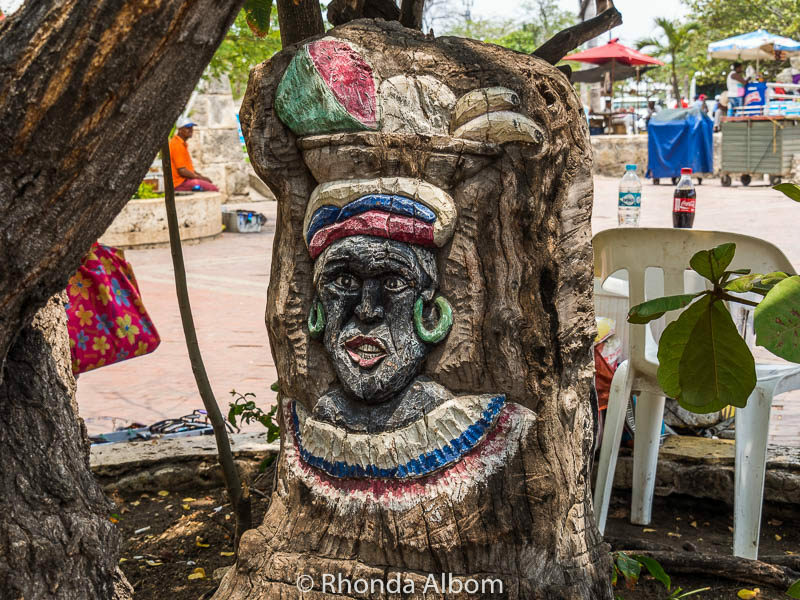 If you love this don’t miss these oversized and undressed statues from around the world. Cartagena is similar in population size to our home city of Auckland New Zealand, with a population of 1.2 million. American dollars are in demand and accepted just about everywhere we visited. Colombian coffee is some of the best in the world. Tipping in restaurants and coffee shops is customary and “done from the heart.” We couldn’t get a straight answer as to percentage, but we have found 10% to be customary in other South American cities and used that as our guideline. 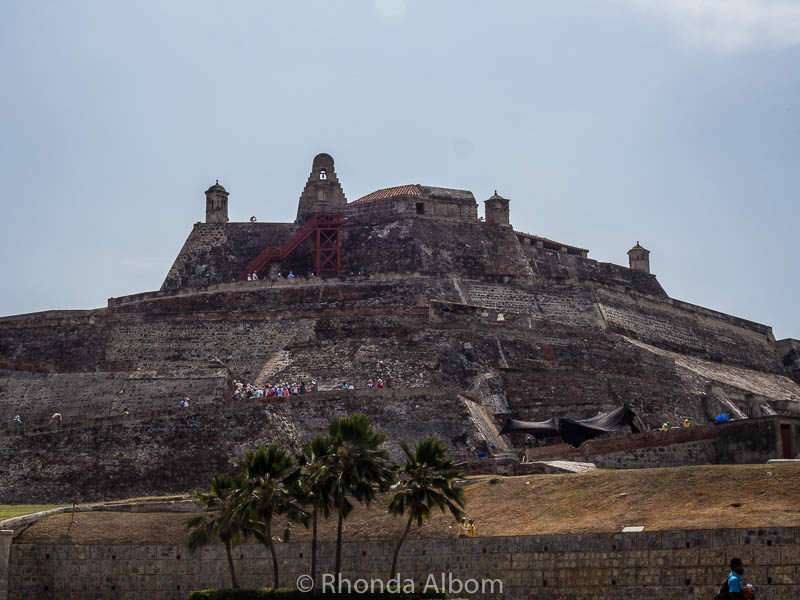 Tickets to the Castillo de San Felipe De Barajas (the fort) are $10 each. If you ask, they will give two tickets for the price of one. In South America, we generally find our accommodations on booking.com, and will do the same on our next visit when we will be looking at Cartagena hotels. Be sure to take time to read the reviews. Also, take note as to the country of origin of the reviewer. We have found standards to be different, and we needed to increase our hotel star rating throughout South America. 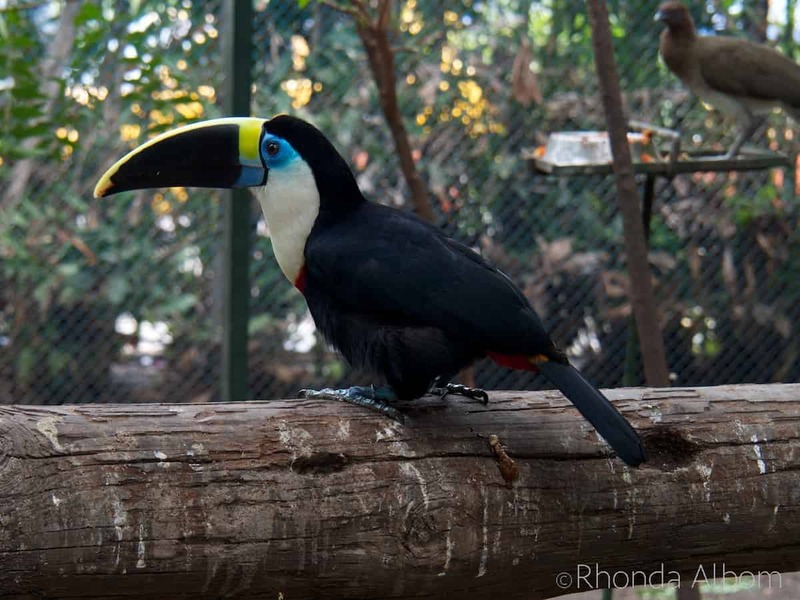 If you arrived via cruise ship, allocate time to enjoy the birds and other animals at the port oasis at the Cartagena cruise port grounds. 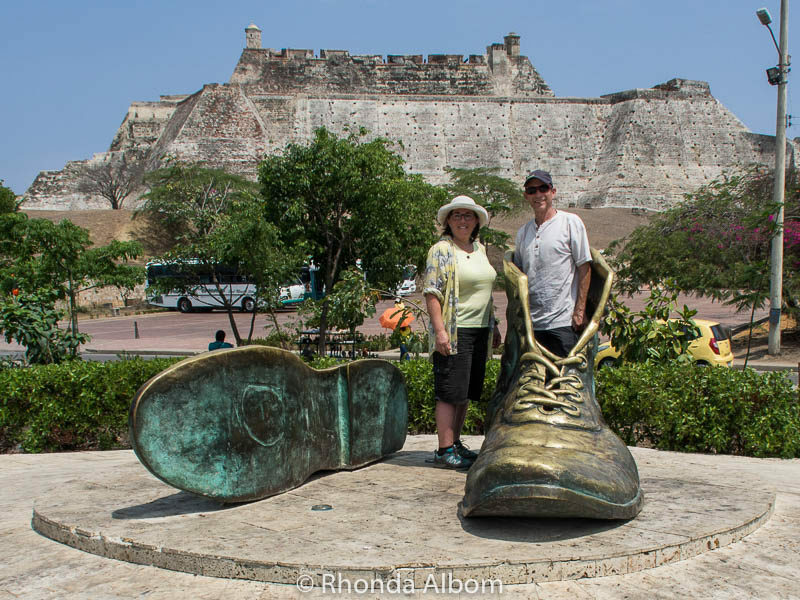 If you prefer a pre-arranged Cartagena tour, Viator offers shore excursion tours. They even offer a worry-free shore excursion guarantee. If you haven’t seen the Michael Douglas and Kathleen Turner movie Romancing the Stone, here’s your chance. Much of it takes place in Colombia. Have you been to Cartagena? Is this how you imagined the city? 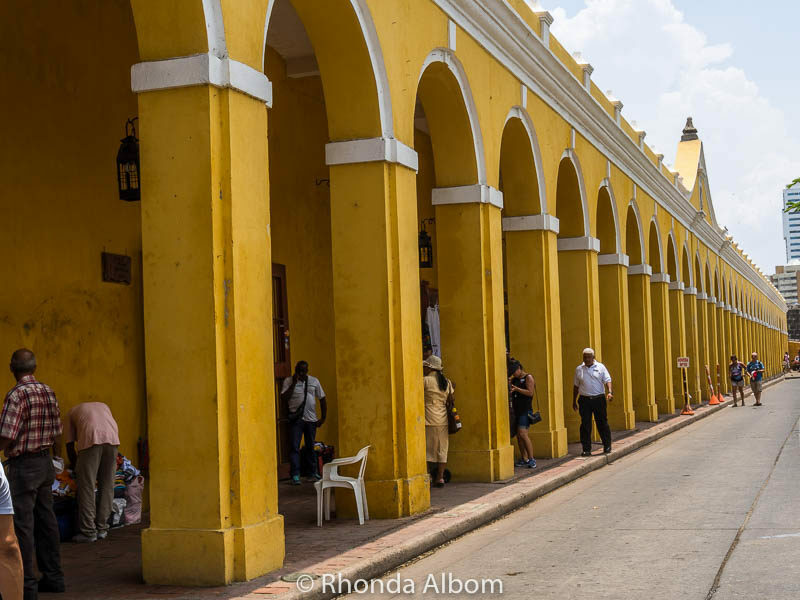 Hi Rhonda – I love your photos of Cartagena. It seems like you had a wonderful time. I´ve lived here for 2 years now and just wanted to clarify some things! A taxi from the airport to the centre costs $12.000 COP – around $4 USD. Maybe in some places – like jewellery shops that sell emeralds – they accept USD, but Colombian Pesos are the main form of currency. If you pay for something with USD you are most likely to be paying double or triple what it really costs. Hi Beth. Thanks for the insight. Sometimes our guides don’t always give us the best information. As for US dollars, we don’t have any, as we live in New Zealand. Clearly, our currency isn’t accepted anywhere around the world (except the Cook Islands). So, we can only go by what we were told on the ship, and by our guide. Great post! We will be there in April. Do you recall how much was the driver for the day? Thanks!! I think we paid about $75 USD for the day. We arrived via cruise ship and picked up our driver at the port. We paid less than the published price they had on the sign and probably could have gotten a better deal outside the port, but we really liked the driver and his English was excellent – important to us as hubby doesn’t speak any Spanish. I can’t wait to go back next year and really explore South America. Beautiful city! My boyfriend and I have been talking about going to Colombia. I’ll have to show him your photos! I can’t wait to go back. One day was not enough. Good to know that you picked a guide who could communicate with you. 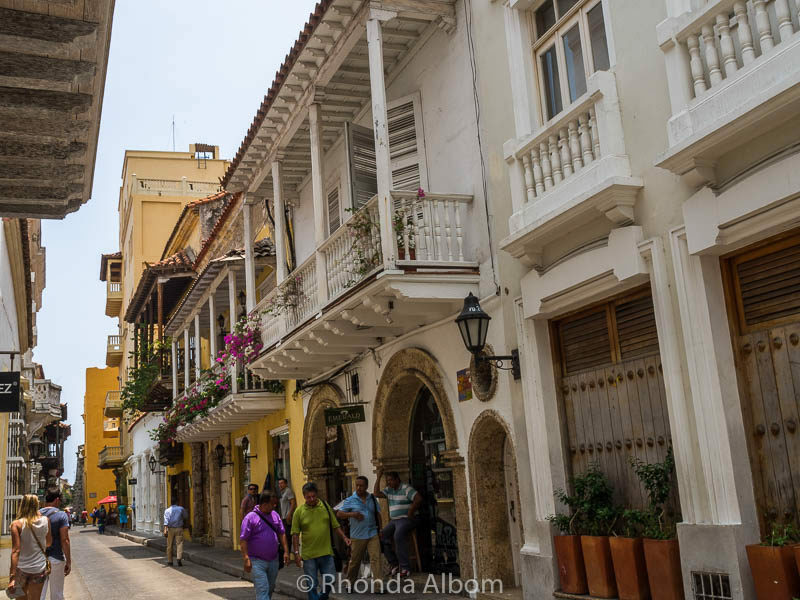 I really love the architecture of Cartagena, the houses give that nostalgic and romantic feeling. Lovely photos and experience, thank you for sharing! Yes, we do talk with several of the guides before we select one. It’s just not as interesting with a major language barrier. Hello Jeff, great photos! Love the one with the shoe, lol! Looks like a beautiful place to visit – Thanks for sharing! It was a lot of fun in Cartagena. Quite hot inside that metal boot. I also associate the city with Romancing the Stone. I keep hearing that it’s quite charming, as your photos show. One of these days maybe we’ll get there…. Yes, that was my first memory of the city but it is so much more. Is it safe to travel to Colombia these days, Rhonda? I would very much like to visit Cartagena. Your post and pictures are so enticing! I wish I could have joined you for one of those beautiful coffees the town looks so intriguing. I have been wanting to visit Cartagena for a long time. Its colors and colonial buildings attract me a lot (looks a lot like Old San Juan). Just a little thing and I am sorry for being picky in here. 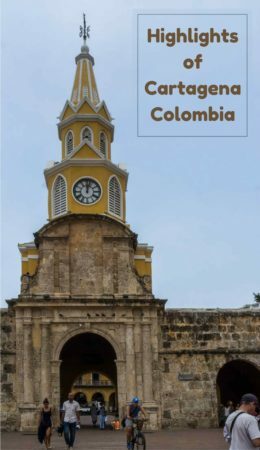 Cartagena is in Colombia not Columbia. Thanks Ruth. It’s fixed now. 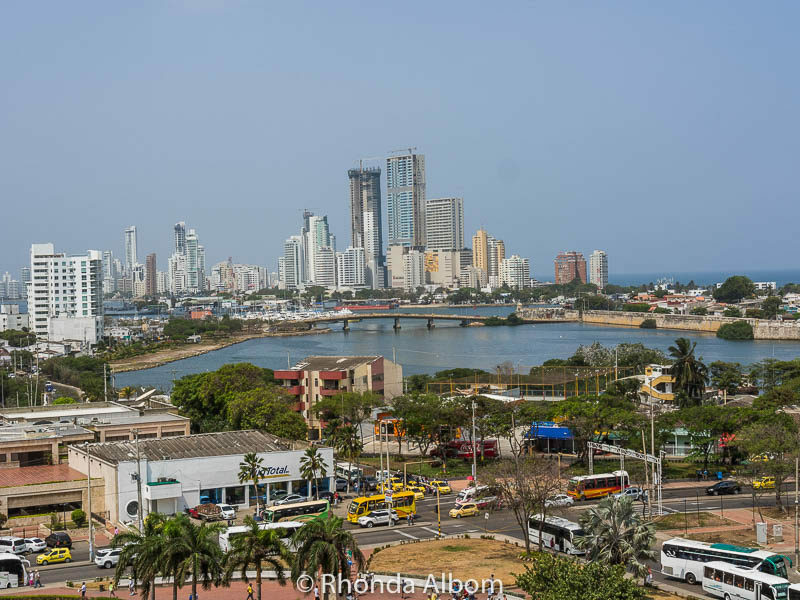 I always think of Romancing the Stone when I hear the name Cartagena, Colombia. We haven’t spent any time in South America since living on the other side of the planet, looks like an interesting place to visit. The movie also reminds me of Cartagena. We saw the wall where Jack jumped into the water. The actual wall is not the same as the one portrayed in the movie. Rhonda, I’m a little jealous. I want to get to more of South America and of course Columbia is high on the list. I love the idea of turning the prison into a shopping area. I’ve never, to my knowledge, come across that before. Pretty cool. It sounds like you are having a wonderful time. Although I normally love Cartenga’s brightly colored buildings, I’m intrigued by the stone architecture of St. Peter Claver Church. Thanks for showing all the unique sides of Cartenga! The church reminded me of those I saw in Spain. I am so happy to see that the boots are still there! We were there in 1988 and have a photo of them. Yes, the boots are still there and they have weathered well. I really had no idea what Cartagena would be like. It looks lovely with lots of history. It is quite old and filled with Spanish history. The monetary is beautiful. I’ve not seen pictures of Cartagena before. Looks lovely. I wish I had more time to take more photos. Some really cool buildings. Glad you didn’t have to contend with drug lords. No drug lords. Our taxi driver said not in Cartagena, only in Bogota, Medellin, and Cali. Wow those shoes look unbelievable or was that just your husband? Ha,ha,ha. Many years ago, my parents had vacationed in Cartagena. I remember because my dad brought me back a sword from the area and I still have to this day. You & your husband must be having a heck of a vacation. One that you will never forget. Thanks for including us with you. I always love the photos that you show to us. Have a brilliant Friday Rhonda. See ya. Thanks. The boots were very big and very hot inside. There are numerous movies and TV shows these days about Escobar and I have to say, I’m quite obsessed with it. Lol. Seeing your post now about Cartagena, I can’t help but think if the universe is telling me something. Could it be possible that I am related to Escobar? Lol. Escobar’s old house is now a supermarket. Cartagena looks like a very interesting city to visit, wonderful architecture, sculptures and statues. Whenever possible we also use guides to show us around a new city or attraction, they always have so much more information to share and can make even the shortest visit twice as good as going it alone. We like impromptu guides (taxi drivers) and city walks to introduce us to an area. It’s a beautiful place. I’d love to taste authentic Columbian coffee. I bought a bag of roasted Colombian beans. Hubby will make me a cuppa when we get home. Cartagena was an unexpected gem. What a beautiful city. I would love to explore this city. And have lots of that coffee too. I would like more time in Cartagena too.